When asked in 1879 why she wanted to journey to such an outlandish place as Patagonia, the author replied without hesitation that she was taking to the saddle in order to flee from the strict confines of polite Victorian society. As her story aptly illustrates, Lady Dixie successfully traded the perils of a London parlor for the wind-borne freedom of a wild Patagonian bronco. As we rode along, our attention was attracted by a faint smell of burning, and presently thick clouds of smoke came rolling toward us. We pressed wonderingly on, anxious to discover the whereabouts of the fire, which we trusted lay somewhere far from our camp. Reaching a slight eminence, we were able to command a view of the country ahead. A cry of dismay escaped our lips as we looked around, and drawing rein, we stared blankly at one another. A fearful sight lay before us. To our left, right in front, and gradually wreathing the hills to our right, a huge prairie fire came rushing rapidly along. Dense masses of smoke curled aloft, and entirely obscured the sky; the flames, which shot fiercely up, cast a strange yellow glare over everything. Even whilst we watched, a strong gust of wind swept the fire with incredible swiftness towards us, and in a second we were enveloped in such a dense cloud of smoke that we were unable to see one another. The situation had now become critical, and not a moment was to be lost. Half-choked, and bewildered by the suddenness with which the danger had come upon us, we scarcely knew what course to take. Already our horses were snorting with fear, as the crackling of the burning grass and bushes came nearer and nearer. 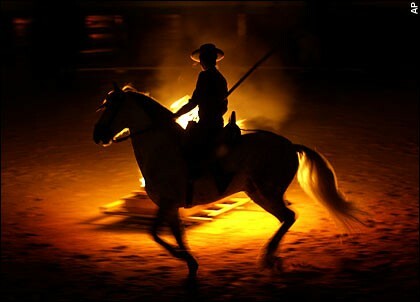 To run away from the coming fire was useless; the alternative was to face it at a gallop and get through it if possible. To throw our capes over our heads, and draw them as tightly round us as we could, was the work of a second, and then digging our spurs into our horses, we dashed forward, every rider for themselves. The moments that followed seemed an eternity. As I urged my unwilling horse forward, the sense of suffocating grew terrible, I could scarcely breath, and the panting animal seemed to stagger beneath me. The horrible crackling came nearer and nearer; I became conscious of the most intolerable heat, and my head began to swim round. My horse gave two or three furious plunges, and then burst madly forward. Almost choked, come what might, I could bear the cape over my head no longer, and tore it off me. The sudden sense of relief that came over me as I did so, I shall never forget. I looked up, the air was comparatively clear, and the fire behind me. By some miracle I had passed through it unhurt. I looked for my companions, and, to my inexpressible joy, saw them emerge one by one from the black mass of smoke, which was now rapidly receding into the distance. Congratulations and exclamations over, we retraced our steps to try and discover how we had managed to escape so luckily. The reason was soon apparent. By a piece of fortune we had happened to ride over a narrow pebbly tract of ground, where the grass was extremely sparse, and where there were but few bushes; had chance led us over any other track where the grass was thick and tall, we could scarcely ever have got through the danger. Our poor horses had suffered a good deal as it was, their feet and legs being scorched and singed severely. Our thoughts flew to our camp, and to our servants Storer and I’Aria, whom we had left behind there. That they had escaped we had little doubt, but for our tents and luggage we felt there was no hope. The landscape seemed completely changed by the fire, all around, as far as we could see, stretched smoking plains, and the outlines of the hills had become quite unfamiliar to us. With rather heavy hearts we pushed forward, eagerly scanning the country for some indication which might guide us to the quarter where our camp had stood. If, as we had every reason to believe, our things were burnt, our Patagonian trip was at an end. Fortunately things did not turn out so badly. Presently my husband, who was riding in advance of the others, gave a shout, and made signals for us to come on. I need hardly say that we did not lose a moment in joining him, and a welcome sight, as we got up to him, met our eyes. Some two or three hundred yards below the hill on which we were, we perceived our little white tents standing safe and unharmed on a narrow green tract of land, which looked like a smiling island in the midst of the vast black plain. Storer and I’Aria, too, we could see moving about, and, overjoyed, we galloped down towards them, they running out to meet us, having suffered no little anxiety, on their parts, as to what might have happened to us. We passed question after question to I’Aria and Storer as to how they had managed to save the camp. Storer was unable to give any intelligible account, so entirely upset was he by fright, but I’Aria’s natural philosophical calm had not deserted him, even on this occasion, and from him we heard all the particulars. The fire, he informed us, had been caused by the Indian we had met in the morning, who was on the look-out for stray horses. This man had amused himself by setting fire to the long dry grass in various places, and, fanned by a strong wind, the flames spread, and soon assumed enormous proportions. Quick to perceive the possible danger our camp was in, the Indian at once galloped up, and with the assistance of I’Aria and Storer, set about making a “contra-fuego” or counter-fire, that is to say, they gradually set fire to the grass all around the camp, letting it burn a considerable tract, but always keeping it well in subjection, beating it out with bushes and trampling it under foot, so that it could not get beyond their control. This precautionary measure was fortunately completed by the time the big fire came on, and, although, for a minute or two, they were half suffocated by the smoke, the fire passed harmlessly by the camp itself. Our extra horses were all safe, as they had been grazing on the far side of a stream in an adjacent valley. Nevertheless the camp was in great disorder; the tents were blackened by the smoke, the provision bags and other chattels lay scattered in confusion. Our furs and rugs had been used to cover the cartridges with, for whilst the fire raged around it, the camp was deluged by showers of sparks, and an explosion might have easily occurred, had this precaution not been taken. For some time we were busy putting things straight, and in the meanwhile Francois arrived from his hunting excursion. Dinner over, my companions were not long before they went to sleep, but feeling little inclination to follow their example, I strolled out, and wandered round the camp, watching with interest the strange changes that came over the landscape as day waned and night came slowly on. The black hills behind the camp loomed like shadowy phantoms against the sky; far and wide slept the silent pampa, its undulating surface illuminated by the rays of a lovely moon. The faint glow which tinged its horizon, and the strange noises which a puff of wind occasionally brought to my ears, showed that the mighty fire was still burning in the distance with unabated fury, perhaps not to stop in its devastating course till it reached the sea-coast, many miles away. For a long time I stood immersed in the contemplation of this weird desolate scene, giving myself up to the mysterious feelings and the many vague and fanciful thoughts it suggested, till, overcome with the excitement and exertions of the day, I had at last to give way to drowsiness and seek my repose.